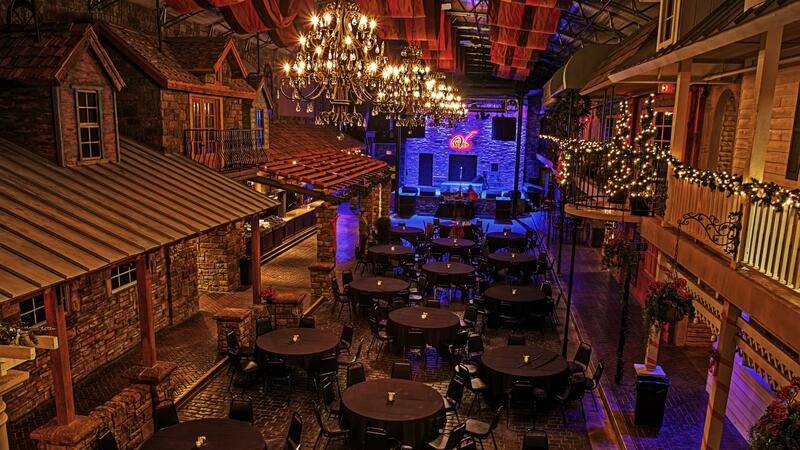 Rent The Venue Scottsdale | Corporate Events | Wedding Locations, Event Spaces and Party Venues. The Venue Scottsdale and VirtueVice, located in the heart of downtown Scottsdale, will wow you with up to 30,000 square feet of event space. The Venue includes the only retractable roof that can bring the magic of the night sky into your indoor celebration. There isn’t a bad seat in the house with the first level main courtyard with cobble stone streets, elegant chandelier, two unique bars that all face a built-in stage. The second level offers a beautiful open VIP lounge that also faces the stage and a ballroom perfect for wedding ceremonies or corporate meetings. Adjoining The Venue Scottsdale is the new VirtueVice, a hip three level lounge featuring bars and outdoor patios on each floor. Enjoy panoramic views and experience The Venue Scottsdale main events on the Rooftop Bar. Featuring Scottsdale’s only retractable roof, enhanced with a cascade of chic chandeliers, the Courtyard offers charm and color, balanced by street-inspired décor. The Billiards Bar features two billiards tables, flat screen TVs, a stylish fireplace, and a stately 26-foot custom bar. The Comedy Spot is fantastic for small parties, intimate concerts, acoustic sets, small stage performances, open-mic nights and poetry readings. Courtyard Bar features luminescent lights and a romantic appeal. Flat screen TVs adorn the bar, while sturdy wood plank floors and intimate, individually-themed booths complete the Old European Tavern décor. The saloon-inspired upstairs Ballroom features soft red silk and velvet lined walls, dark mahogany paneling, crown molding and chic chandeliers. A French-inspired VIP Lounge offers an unobstructed view of the main Courtyard below. Showcasing custom-designed wrought iron railing, ornate wooden tables and chairs, intimate lighting, a private bar, plush French-style couches and a cozy window seat overlooking Old Town Scottsdale.